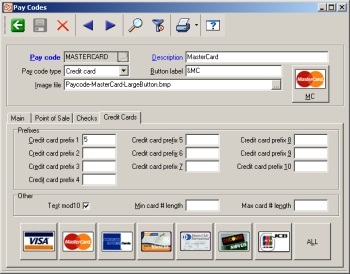 CounterPoint SQL includes credit card processing with the CounterPoint Merchant Program (CMP). With the Credit Cards Option, you can choose to aditionaly process through any CounterPoint Preferred Processor. ►Any bank compatible with a Preferred Processor Using a CounterPoint Preferred Processor ensures compliance with rapidly changing standards and access to the most favorable rates, as well as industry classifications (Retail, Mail-order/ Telephone-order, and Ecommerce), AVS, CVV2/CVC2, dial-up processing, purchase/corporate cards, and CPGateway. CounterPoint is approved by Visa as a CISP Validated Payment Application. Visa enforces strict guidelines for the Cardholder Information Security Program (CISP) for any system that accepts credit cards. CISP ensures that cardholder information is secure and protected against theft. Store credits and gift certificates can be issued, printed, partially redeemed, reissued, and voided. Rechargeable gift cards and shopping cards with magnetic stripes are also supported. Certificates and cards may be redeemed at any store or restricted to the issuing store. Taxes are calculated automatically based on the taxable status of the merchandise and the customer. Tax calculations can be overridden by authorized users on a per-ticket basis, or individual line items can be set to “no-tax.” An entire ticket can be nontaxable by entering a tax registration (tax exempt) number. Tax can be a percentage of the sale amount, an amount per piece, or a combination. An item’s tax can be different for each location. Tax figures are printed on end-of-day reports and are retained for historical purposes. Surtaxes (taxes on the tax) and Canadian PST/GST calculations are also supported. An unlimited number of payment types (e.g., cash, check, A/R charge, or credit card) may be defined. Each payment type may be defined to open the cash drawer, allow change to be given, and to require validation (such as a credit card or driver’s license number). An unlimited number of payment types can be accepted on a ticket, including multiples of a single payment type (such as two different Visa cards). You can also specify restrictions on each payment type. For example, you can require a $10 minimum on all Visa cards, or set a $5 maximum cash back amount for gift certificates. End-of-day reports provide reconciliation information for each type of payment. Historical data is retained and reported for each payment type.